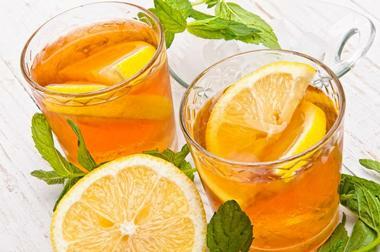 Washington, D.C. is another American city that has long had a reputation as a solid steakhouse town, so when it comes to vegetarian and vegan cuisine, one would immediately assume that finding a decent spot to eat might be difficult. 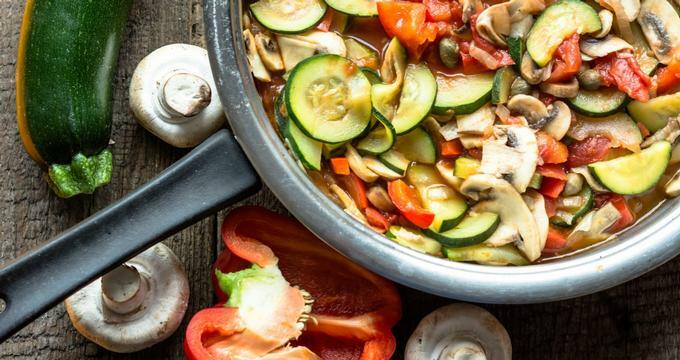 Contrary to popular belief, however, there is a wealth excellent strictly vegetarian or vegan restaurants as well as restaurants that offer both meat and vegetarian options but play the plant-based diet game. From fast casual fare to fine dining experiences, here are some of Washington D.C.’s best non-meat-centric places to eat. Located in a historical townhome in the heart of Washington, Elizabeth’s Gone Raw offers an upscale vegan dining experience on Friday evenings only. Owner Elizabeth Petty’s 3-hour meal includes a raw vegan tasting menu of six courses with complimentary kale chips and optional organic wine pairings that will leave even the toughest wine aficionados impressed. The restaurant pays homage to her discovery of the healthy benefits of raw-vegan cuisine after a battle with cancer in 2009, and includes tasters of lime-cashew yogurt, porcini paper, and spirulina powder. The perfect place for a special occasion, Elizabeth's Gone Raw is open for dinner on Friday nights only. 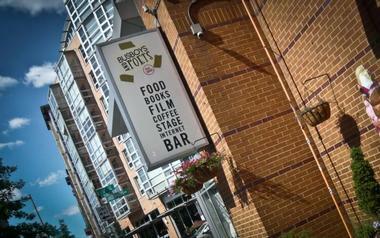 Named for American poet Langston Hughes, Busboys and Poets is an original hipster enclave and a D.C. institution. Part alt-bookstore and part vegetarian-centric restaurant, Busboys and Poets was established by Andy Shallal to create “a space for art, culture, and politics to intentionally collide,” and he has done this with great success. Boasting a performance space, bookstore, and café all under one roof, foodies will delight in the extensive selection of vegetarian and vegan dishes from the restaurant, ranging from out-of-this-world vegan nachos to vegan crab cakes and “tuna” salad. Busboys and Poets has locations in Hyattsville, Brookland, Shirlington, Takoma, and Mount Vernon Triangle and is open for breakfast, lunch, and dinner every day of the week. 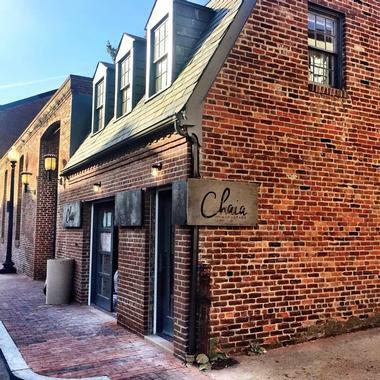 Chaia is a fast-casual, farm-to-taco joint that made the move from being a longtime stalwart at local farmers markets to a beautiful brick-and-mortar space in Georgetown, much to the delight of its fans. Offering urban street fare consisting of vegetarian and vegan corn tacos stuffed with fresh, seasonal produce and topped with local micro-greens, Chaia has fast become the go-to place for unrivaled tacos. The menu features an array of vegan or gluten-free corn tacos with mouthwatering fillings such as creamy kale and potato with pickled onions, poblano crema, pepper jack cheese, green sauce, skillet corn, a cilantro-lime crema, Monterey Jack, and Sun Gold tomatoes. 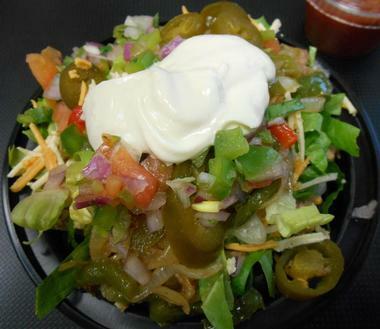 Tacos are served with sides like green rice and black beans, along with a variety of beverages. Owned and managed by husband-and-wife team Todd and Ellen Kassoff Gray, Equinox offers a combination of market and plant-based cuisine that includes meat, vegetarian, and vegan options. 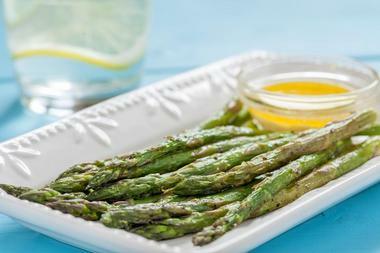 While the menu isn't entirely vegan, it is easy enough to ignore the meat or fish entirely and choose veggie-only options, which include artichoke soup, crunchy artichokes alla Romana with red pepper aioli, tempura cauliflower with fall vegetables and rice, and charred asparagus with baked spaghetti squash and cashew cheese. 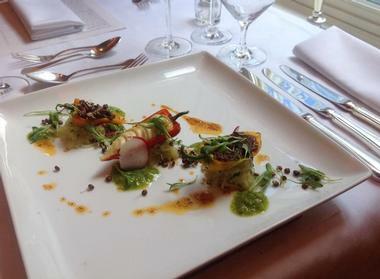 Diners can either order off the a la carte menu or choose from a three, five, or seven-course tasting menu, while on Sundays they offer a famous vegan buffet brunch. Equinox is open for lunch and dinner, 7 days a week. Evolve Vegan Restaurant takes a different approach to food by offering heart-warming, belly-filling fare comprising 100% vegan soul food. Boasting a warm and welcoming ambiance that has won rare rave reviews, the full-service restaurant also provides a lineup of local brews alongside classic and original cocktails to accompany the delicious fare. Favorites on the menu include eggplant Parmesan, Southern-fried chicken, vegan mac and cheese, German chocolate cake, and cheesecake for dessert. 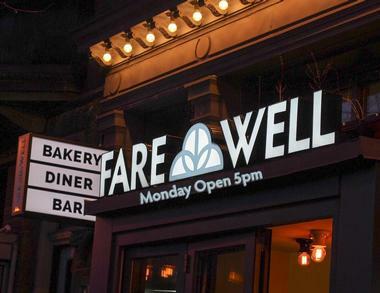 Fare Well is a full-service bistro and bar that also offers takeaway food and bakery items on H Street NE. Owned by Doron Petersan, D.C.’s first plant-based dining establishment has chef Amanda Desaulniers behind the helm, who produces freshly prepared cuisine on site each day. Dishes include cashew cheddar, garlic and onion potato pierogis served with sautéed greens and sauerkraut, and cavatelli with rapini and seitan sausage as well as a mushroom-chickpea burger with sunflower seeds, garlic aioli, walnuts, and caramelized onions. Open for breakfast, lunch, and dinner, the restaurant is a boutique coffee shop, serving pastries, fresh-baked bread, and other sweets in the morning, and a friendly neighborhood bistro for lunch and dinner. Part of a Philadelphia-based chain, HipCityVeg is a fast-casual restaurant that uses 100% organic non-GMO ingredients to produce delicious plant-based cuisine. The popular eatery focuses on healthy comfort food, like burgers, chicken sandwiches, and chicken nuggets, made with farm-fresh ingredients that are delivered every morning. Scraps are composted or recycled at the end of every day, standing by their environmentally-friendly philosophy. The menu features favorites such as the Ziggy Burger with smoked tempeh and special sauce, a battered chicken sandwich with creamy peppercorn ranch called the Crispy HipCity Ranch, as well as salads, sweet potato fries, smoothies, and desserts. 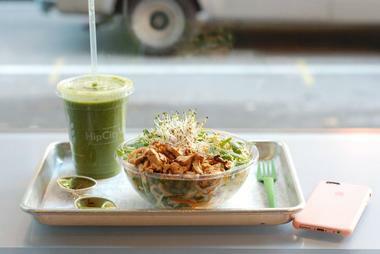 HipCityVeg is open for breakfast, lunch, and dinner, 7 days a week. 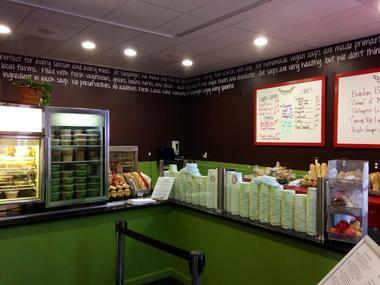 Khepra's Raw Food Juice Bar is a vibrant take-out spot that serves organic, raw vegan fare, including fresh salads, entrees, and sides, along with a selection of juices. Part of the bright restaurant space is given over to a store selling natural body care products, incense, and clothing from Africa, while the cozy dining area has comfortable tables and chairs where diners can tuck into a variety of raw, organic vegetarian fare. Favorites on the menu include coconut crab cake, lasagna, avocado plantain pie, BBQ NeatLoaf, coconut crab sandwich, and the signature Almond HempBurger. Also on the menu are pizzas, avo wraps, and pumpkin pie. Khepra's Raw Food Juice Bar is open for lunch and dinner every day of the week and only lunch on Sundays. Formerly known as Everlasting Life and Woodlands Bistro, NuVegan Café specializes in and serves vegan and vegetarian soul food with a diverse lineup of 100% plant-based fare. 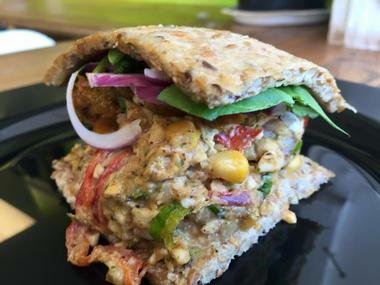 Situated in two locations around the city, NuVegan offers a menu of appetizers, entrees, sharing vegan platters, sides, smoothies, shakes, and cold-pressed juices. Menu favorites include vegan BBQ ribs, collard greens, and fried (tofu) chicken as well as delicious baked treats from the eatery’s bakery. 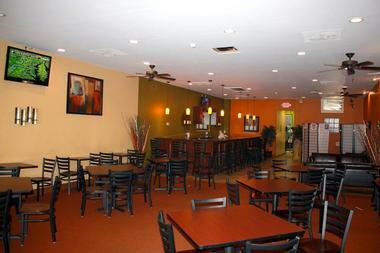 NuVegan Café is open every day of the week for breakfast, lunch, and dinner and has several locations around the city. 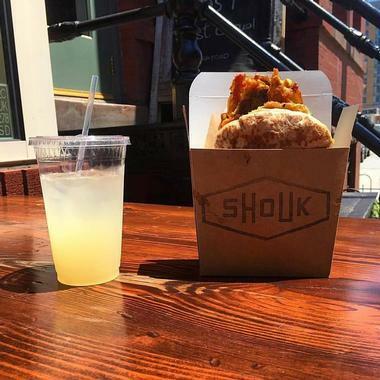 Shouk is a Middle Eastern-inspired, vegetable-focused restaurant that serves a variety of plant-based organic fare from fresh salads and homemade soups to vegetable or legume-stuffed pitas. Owned by Ran Nussbacher, the Middle Eastern-centric restaurant offers a 100% plant-based menu that is anchored by a variety of delicious pitas and house-made labneh, a traditional Lebanese spread made from fermented cashews. Diners can choose from a range of different pita combinations, including black bean with sweet potato, red pepper, tomato, arugula, and spicy harissa and chickpea with preserved lemon, olive, seaweed, potato, tomato, cucumber, and tahini. Diners can also opt for a rice and lentil bowl or a salad instead of the pita. Shouk is open for lunch and dinner daily. Soupergirl is a cheerful take-out spot that offers vegan and kosher soups, fresh salads and homemade bread, all of which are prepared with locally sourced seasonal ingredients and made fresh every day. The changing daily menu features soups such as Italian barley and greens, lentil summer vegetable, spring vegetable, and Tuscan white bean as well as signature soups like lasagna soup, split pea rosemary, and white bean zucchini spinach soup. Also on the menu are fresh salads, sandwiches, hummus, sides, and desserts of chocolate chip cookies and rice pudding. Soupergirl is open Monday through Friday for breakfast and lunch and is closed on the weekends. 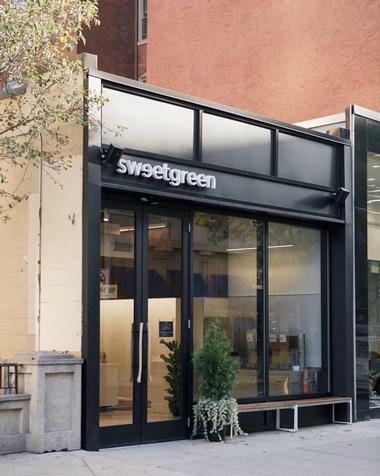 Founded in 2007, sweetgreen is a casual restaurant that serves simple, seasonal, healthy food. With a mission to “inspire healthier communities by connecting people to real food,” sweetgreen is committed to supporting small and mid-sized sustainable farmers and producers. The menu features a variety of seasonal and warm bowls, fresh salads and various make-your-own options with signature dishes such as the Strawberry Fields with organic arugula, local feta cheese, spinach, strawberries, cucumbers, cilantro, snap peas, fresh sunflower seeds, and a tangy lime cilantro jalapeño vinaigrette. sweetgreen is open 7 days a week for lunch and dinner and has locations all around the city. Teaism Penn Quarter is a traditional tea house that serves a variety of coffees and teas, along with sandwiches, snacks, cookies, and bento boxes in a bright and sunny ambiance. The menu features starters of three-way beets with goat cheese, beets, and flatbread served with roasted and pureed chickpeas, coriander, kale salad, and fried Brussel’s sprouts. Entrees feature South Indian vegetable curry, okonomiyaki Japanese cabbage pancakes, and black bean cake, alongside soups, sipping broths, fresh salads, a variety of sides and decadent desserts. 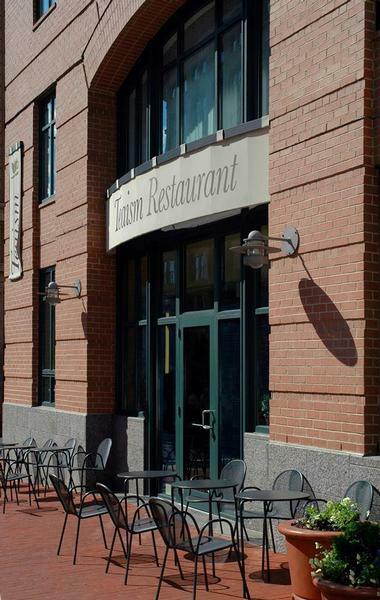 Teaism Penn Quarter is open 7 days a week for breakfast, lunch, and dinner. Sister restaurant to Everlasting Life and Evolve Vegan Restaurant, Vegaritos Vegan Restaurant is an all-vegan burrito and burrito bowl café that serves tasty vegan cuisine in a fun new way. The menu features a range of authentic burritos and burrito bowls as well as make-your-own options with vegan or chicken and portobello mushrooms, black or red beans, and jasmine or brown rice. A variety of artwork is displayed in the restaurant, which can be purchased. Vegaritos Vegan Restaurant is open for lunch and dinner from Monday through Saturday and is closed on Sundays.